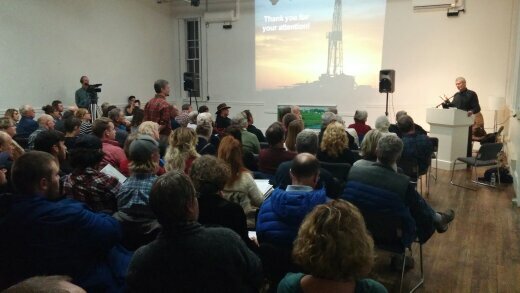 Fredericton, NB (Nov 18, 2015) – Shale gas development (SGD), ‘ fracking,’ has created exceptional controversy in North America, Europe and beyond, with public resistance so strong that SGD is banned in many areas regardless of desire to proceed by government and industry. SGD is active in the western provinces, but banned in the eastern provinces of Canada, and banned or on hold in many European countries. Many expert panel reports have been produced in North America and Europe about the environmental issues, including a report produced by a Canadian expert panel of which I was the chair, released May 2014. All expert reports have deemed groundwater issues and uncertainties to have utmost importance. The most difficult issue concerns potential impacts on groundwater of ‘stray gas’ –primarily methane–and potential impacts of stray gas leakage into the atmosphere. The stray gas methane comes from well bores that have leaky cement seals so that gas leaks upward by buoyancy along the wellbore to escape into fresh groundwater, where it may cause adverse impacts on its own, or through methane-induced biogeochemical reactions that degrade groundwater quality as the gas reacts with minerals and natural constituents in the groundwater. The impacts of these reactions are unknown, because almost no science-focused monitoring has been done anywhere. Therefore, predictions of long-term cumulative impacts on groundwater are uncertain. The groundwater sampling for impacts done to date has been limited to household and farm wells. Because this type of sampling cannot produce definitive results it has generated controversy. These types of wells blend water from different layers and commonly have leaky casings allowing entry of surface runoff. Also, these wells are rarely situated for effective detection of impacts to groundwater resources. There is now agreement in the scientific community that more rigorous groundwater baseline monitoring must be done to build toward a consensus on existing impacts, and develop better predictions about long-term impacts. My talk outlines approaches for monitoring, and indicates the nature of research recently initiated in Canada on methane reactions and monitoring methods. So little research is in progress that answers to the important questions will take decades to produce at the current rate. On one side of the public debate about shale gas development there is the position that shale gas development is a big environmental and human health experiment for which the long-term outcomes will likely be bad. Those on the other side of the debate deem this to be incorrect based on the premise that all reasonable concerns can be alleviated by ‘best management practices’ and improved monitoring. From my hydrogeological perspective, I view shale gas development as a big experiment for which we have minimal scientific basis for predicting the outcome for the impacts of stray gas on groundwater quality. We cannot predict the magnitudes and locations of leakage, other than to expect that the gas leakage will increase as the cement inevitably deteriorates. Cement is unstable in the harsh geochemical conditions in which it exists along the well bores. The fact that shale gas development is a big experiment in this context is not reason enough on its own to condemn this form of energy extraction. Other forms of energy such as nuclear and large hydroelectric projects were initially big experiments. 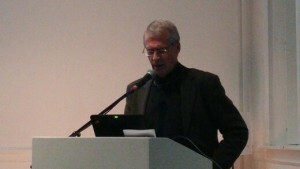 What sets shale gas apart is the absence of a commitment by government to the design and monitoring of the experiment. This big experiment was initiated with intensity more than a decade ago in western Canada and the United States without rigorous groundwater monitoring of impacts. Without such monitoring, risk assessments for long-term cumulative impacts projected from that first decade of intense shale gas development suffer from large uncertainties. Not only is shale gas development a big scientific experiment but it is also a complex experiment in governance. In Canada so far, this experiment has demonstrated that our combined federal/ provincial system of governance is incapable of developing science-based regulations for managing and protecting groundwater and for establishing a reasonable basis for pursuit of social license in those regions where it does not exist. By not recognizing the experimental nature of shale gas development, and thereby not developing and implementing appropriate research and monitoring, government has acted irresponsibly in its obligation to protect the well being of present and future generations. What is needed in Canada is a national energy policy, so that all decisions about the pursuit of any new energy sources, particularly those that emit greenhouse gases, are assessed in the context of the big picture and long term. 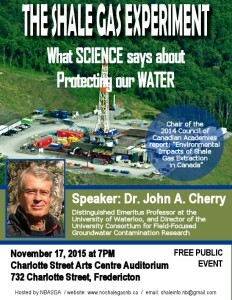 Dr. Cherry served as the Chair of the 2014 Council of Canadian Academies report, “Environmental Impacts of Shale Gas Extraction in Canada.” This report came as the result of Environment Canada’s request for a multidisciplinary expert panel to consider the state of knowledge of potential environmental impacts from the exploration, extraction, and development of Canada’s shale gas resources. In addition to Distinguished Emeritus Professor at the University of Waterloo, he is currently the Director of the University Consortium for Field-Focused Groundwater Contamination Research. His Fredericton presentation reflects the observations gained during his team’s research for the Council of Canadian Academies report and, while here, he will also present these observations to the NB Commission on Hydraulic Fracturing. Because he is neither an advocate, nor opponent of shale gas, his observations on the current state of the science in his specialty of groundwater contamination are especially powerful and relevant to a jurisdiction like New Brunswick, which is contemplating shale gas development. Posted in: Community Events, Most Asked Questions, Research & Scientific Studies, Water Issues.